Here at Verbal Commits, we receive an avalanche of information every day. We're used to hearing rumors, hearsay, half-truths, and just plain wishful thinking. A scholarship is a life changing proposition for many recruits, so we're inclined to understand someone bending the truth to suit their own priorities. If claiming a couple of offers gets you noticed by a couple of other schools, maybe that next school will give you a shot at an offer. We feel our first responsibility is to the recruits and their families. We understand that there are a limited number of scholarships available each year, and not all of the recruits are ultimately going to be rewarded for all of their hard work. However, we try to give the recruits a platform to get noticed, we setup pages dedicated to them, add any highlights, twitter feeds, articles, and the like for every player. We also provide the recruits with as close to a true picture of the scholarship offers and interest at each school as we can. When we get information regarding offers from a recruit, we've learned to check the veracity of the claims. When there are discrepancies, we try to encourage the players to follow up with the coaches and get a better understanding of what was discussed so that everyone is on the same page. Usually when we've received unfounded claims of scholarship offers in the past, we go back to the recruits and tell them that we were unable to verify the information that they provided. Presumably the recruits understand that we're doing this for all players and offers, and that this means that they can rely on us for accurate information (or at least, the best equivalent of accuracy in the world of recruiting). Recently we had a player claim several offers, and when we went to verify those offers, we found that all of the offers were false. When our Chief Data Officer, Nathan LeClair, followed up with that recruit regarding those offers, the player doubled down. The recruit attempted to pass multiple fake emails, purportedly from a coach, on to us to prove that he did indeed have an offer from that school. When Nathan again looked into the situation and found out what happened, he informed the recruit of his discovery. The recruit's response? He spent the next week on a tirade sending Nathan a stream of demeaning invectives. Nathan informed the recruit that he would not be dealing with him again. All of which leads me to my involvement. 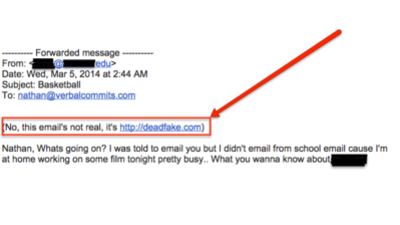 Late last week I received an email directly from the same recruit, who informed me that he needed a profile. I took his email at face value, and forwarded the information on to Nathan who is in charge of keeping all of the data accurate on Verbal Commits. It was only then that Nathan related the entire back story with this recruit to me, and that he was no longer going to deal with the recruit. After having been made aware of this situation, I personally verified with the coach in question that the emails did not come from him. Upon receipt of confirmation, I informed the recruit that, for the first time since I started this site four years ago, we're not giving a recruit a profile. I want to make it clear to all that Verbal Commits will not condone this type of repeated lying and abuse. As for the young man, I wish him well in life and basketball, and I hope he learns from this experience. Paul Pettengill is the Founder and CEO of Verbal Commits. Prior to lauching Verbal Commits, Paul worked in technology consulting and enterprise software. When he isn't working, Paul loves spending time with his very beautiful and very patient wife, and his adorable but not quite as patient son - make that sons plural.